In early December, we used Japan as an extreme example of why central banks are terrified of allowing their respective economies to slip into a deflationary spiral. Do the same concepts apply to the United States? They do. The federal government offers standard Treasury bonds (IEF) and Treasuries that provide some protection against inflation (TIP). The law of supply and demand tells us that when demand for TIPS is greater than the demand for standard Treasuries, investors are concerned about future inflation. Conversely, when demand for TIPS is lagging demand for standard Treasuries, investors are not too concerned about inflation eroding the value of their interest payments. 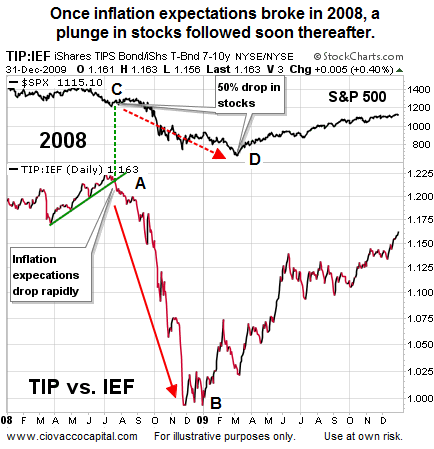 The chart below shows the S&P 500 (top) and the ratio of TIP-to-IEF below it. Demand for TIPS started to drop significantly in July 2008 (left of point A). As inflation fears plummeted, it helped foreshadow the big drop in equities between points C and D. The chart below helps us understand the Fed’s concerns about possible deflation. 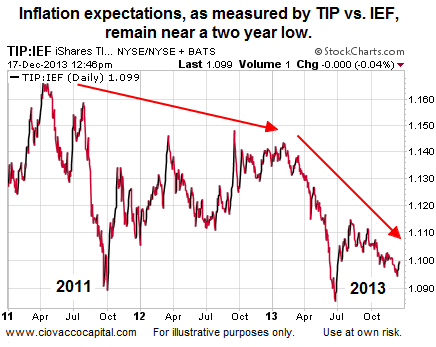 How weak are inflation expectations in 2013? Even with the Fed conducting three separate money-printing campaigns (QE), investors are not migrating to TIPS for inflation protection, which speaks to their relatively weak expectations about future inflation. The Fed’s bond buying has failed to help them meet their inflation target of 2%, (as of November data inflation is at 1.24%) which aligns with the feedback from the TIP/IEF ratio. Officials are also not particularly afraid of inflation. While some Fed officials worry about the risk that buying bonds will lead to faster inflation, the Fed, if anything, is increasingly confronting the opposite problem. Several Fed officials in recent weeks have expressed puzzlement over why prices have been rising at an unusually sluggish pace. The odds of a “no taper” announcement Wednesday are higher than many believe. If Wednesday brings a taper, the size of the taper will be relatively small and accompanied by “we may print more, or we may print less going forward based on the economic data”. Donald Kohn, former Fed vice chairman, said Friday he would hold off until next year before reducing the bond buys. However, he sees better-than-even odds the central bank will move Wednesday. “I think I would wait. But it’s a very close call,” he said. Even if we had Wednesday’s Fed statement in hand, it would not be as helpful as you might think. Why? We still would not know the market’s reaction to the statement. 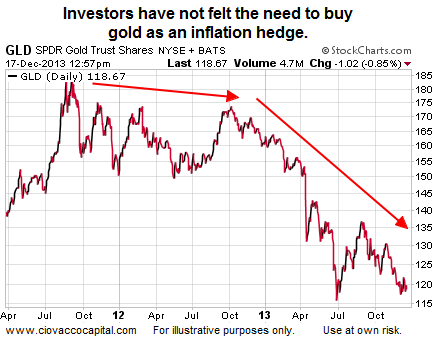 Since the market sets asset prices, the reaction is much more important than the statement itself. Therefore, our game plan is to see how things unfold over the next few days and adjust accordingly. For now, we will continue to hold a good size risk buffer in the form of cash, to compliment our exposure to U.S. stocks (VTI), technology (QQQ), financials (XLF), energy (XLE), small caps (IWM), emerging markets (EEM), and foreign stocks (EFA). Chris Ciovacco is the Chief Investment Officer for Ciovacco Capital Management, LLC. This article is © Ciovacco Capital Management, LLC. All Rights Reserved and originally appeared here and is reprinted by permission.